Have you ever heard the tremendous clatter of a working power loom? Now’s your chance! The sound of a power loom weaving at full pelt is unforgettable and truly atmospheric. 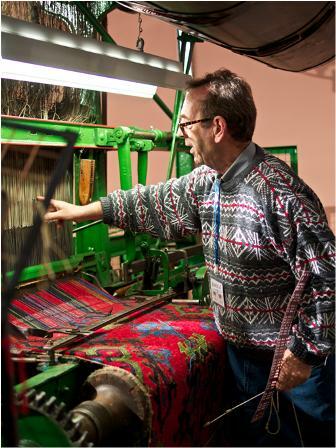 We are lucky to have two working looms at the Museum of Carpet, a Wilton and and Axminster. Both had long working lives in the town’s carpet industry before finding a home with us. Bernie leads a team of volunteer weavers who come in twice a week to demonstrate these fantastic looms, share stories with visitors about the development of the carpet industry and the changing methods of designing and making carpet. Bernie himself used to work for Woodward Grosvenor when they were based in Stour Vale Mill, our current home. We have just confirmed the next series of dates for Bernie to come in and demonstrate looms. He’s well worth a visit! You might even want to buy one of his carpets in our shop before you go!